U.S. Highway 66 in Oklahoma occupies a very special place along the great arc of the Mother Road. Here the densely populated and nuanced terrain of the Midwest meets the western road’s wide open plains country. At the creation of Route 66 in 1926, Oklahoma was not yet 20 years into statehood and was still developing a modern infrastructure, which the condition of its transportation and communication network at the time illustrates. As late as 1926, Oklahoma had more railroad mileage, the transport choice of the 19th century, than road miles. On the eve of the Mother Road, less than 12% of the State’s roads had hard paved surfaces. As a result, the first generation of Route 66 roadbed in Oklahoma was a patchwork of disparate and often primitive roads. This situation soon improved as the State, with Federal support, replaced Oklahoma’s various private highway associations as custodians of the roadway. This shift demonstrated a new level of State and Federal partnership in organizing human and material resources. From its very beginning, Route 66 in Oklahoma was a work in progress, constantly undergoing rerouting, widening, straightening, and resurfacing. The straightening and realigning of Oklahoma Route 66 shortened it by 47 miles between 1926 and 1951. Route 66 in Oklahoma offers a good example of how a road and its environment can be mutually sustaining. With the improvement of the roadbeds and the increase in local and interstate traffic, new commercial activity sprouted up along the Oklahoma roadside. These interconnected developments exposed many of the State’s isolated rural communities to a broader range of social, cultural, and economic contacts. In a sense, both Oklahoma and Route 66 grew together. The story of U.S. Highway 66 in Oklahoma is not exclusively a tale of uplift and progress, however. While many roadside communities flourished, others suffered when they lost the highway in one of its periodic realignments. For some, moreover, the coming of an exciting, wider world via Route 66 proved an unwanted experience. In addition, the trek of Dust Bowl migrants along the Mother Road during the 1930s continues to evoke vivid images and memories of human suffering. The postwar boom in tourism and transport catapulted Route 66 into its Golden Age but also nudged it closer to extinction, as Oklahoma opted to replace the eventually overburdened highway with a new generation of multi-lane, limited access thoroughfares. By 1957, the Turner Turnpike and Will Rogers Turnpike connected Oklahoma City to Joplin, Missouri, and after 1970, Interstate 40 spanned the entire western half of the State. These super highways relegated Route 66 to servicing local traffic. These five road segments total only about 26 miles, but they offer the traveler along historic Oklahoma Route 66 a vivid picture of the highway’s historical development. They are valuable artifacts that tell a story of evolving pavement design, traffic engineering, and changing patterns of social interaction. The Route 66 segments at Miami, West Sapulpa, Stroud (Ozark Trails), and Arcadia represent the earliest roadbeds, those that existed prior to their designation as part of the new national highway in 1926. These sections offer the traveler good examples of the road engineering and construction methods from the early 20th century. The fifth segment, the Bridgeport Hill-Hydro section, including the famous William H. Murray Bridge, is primarily a product of road improvement from the early to mid 1930s and represents conditions that characterized the second generation of Oklahoma Route 66. The road segments are in order geographically east to west. At its inception, U.S. Highway 66 consisted simply of existing State routes across the continent pieced together. The result was a national highway composed of a disparate chain of road segments stretching from Chicago to Los Angeles. Of all these first generation roadbeds, the Miami Nine-Foot Section must rank among the most unique. Constructed between 1919 and 1921, this three-mile segment south of Miami stands out because it is only nine feet wide. The reasons for this odd gauge remain obscure. Legend explains it as a lack of funding; highway engineers had the choice of either paving a short distance with two lanes or a longer distance with one lane, which was what they chose. Despite its peculiar width, the road was of sound construction according to the technology and materials of the time. The original roadbed consists of large stone, Topeka asphalt over a concrete base, flanked with five-foot gravel shoulders. At two sharp curves in this otherwise straight segment, the road widened and banked. Originally part of State Highway 7, this segment became Route 66 between Miami and Afton in 1926. It remained Route 66 until the realignment and widening of the highway in 1937. Today, the original roadbed and curbing are still visible in places, despite the covering of its Topeka asphalt with a more recent layer of asphalt and loose gravel. The road continues to serve local traffic. This 3.3-mile section of meandering country road was originally an unpaved part of the Ozark Trails, a private road network that spearheaded Oklahoma’s early road development. 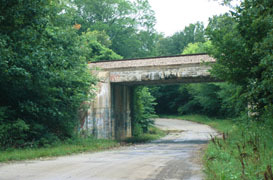 Built in 1924-25, the current roadbed was part of a county, State, and Federal partnership to connect the eastern Oklahoma towns of Sapulpa and Bristow with a modern, paved road. The construction materials and road design met the highest State and Federal standards in the 1920s. The two-lane roadbed of Portland Concrete was a standard 18 feet in width with graded three-foot shoulders on each side. After a long legal battle with the Frisco Railroad Company, the installation of a poured concrete railroad trestle allowed for a critical underpass about two miles into the road. This victory reflected the growing dominion of the automobile over the railroad. In addition to this trestle, other original features include Bridge No. 18 at Rock Creek, a 120-foot long steel truss bridge with red brick decking, and the Biven Creek Box Drain. This segment also features a two-mile stretch of original concrete guardrail and retaining wall. Designated as Route 66 in 1926, this heavily traveled road began to flourish commercially, sprouting numerous gas stations, motels and cafés along the route, as well as the now defunct Dixieland Amusement Park. A wider and straighter alignment constructed to the north replaced this road segment’s designation as Route 66 in 1952. Today, the road retains much of its original integrity. Patches of a later asphalt overlay cover the length of the road. The 1.3 mile Ozark Trails stretch of dirt roadbed does not automatically conjure up images usually associated with historic Route 66. This section has no asphalt, no neon signage, and no crowded roadside cafés, yet this short stretch of straight dirt road remains an important remnant of the Mother Road’s early history. The U.S. Highway 66 corridor created in November 1926 often took advantage of the pioneering work in road construction carried out in the early 20th century by private and local “good roads” associations from Missouri to Arizona. As part of the organization’s regional effort to modernize Oklahoma’s roads, a local subdivision of the Ozark Trails Association constructed this segment between 1915 and 1917. Today, this section remains in its original condition as a so-called “improved” dirt road--a dirt road that was occasionally graveled and graded. It is approximately 18 feet wide, but with variations, as there is no precise edging to the pavement. An old and rare Ozark Trails Monument--a 21-foot stone obelisk that marked the intersection of Ozark Trails roads--sits at the eastern end of the segment. On the western end was the Dosie Creek Bridge, a steel truss, wood-decked structure constructed in 1917, then demolished and replaced in 2004. In the middle of this segment are two original stone Box Drains probably built in 1917. After the road’s designation as Route 66, traffic increased and roadside businesses took root--a development cut short in 1930 with the construction of an improved alignment of Route 66 further north. This original Route 66 two-lane roadbed, about nine tenths of a mile in length, follows along a wooded hillside approximately one mile east of Arcadia. 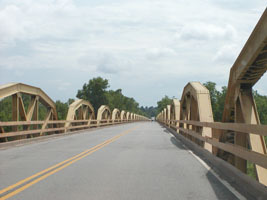 Constructed as an unpaved section of State Highway 7 in 1922, it was paved during the years 1928 and 1929, shortly after the newly designated U.S. Highway 66 incorporated Highway 7. The surfacing of this roadbed in the late 1920s-–with the most up to date materials and standards--illustrates the impact of the national highway system as increased traffic volume accelerated modernization. It also underscores the impact of federal funding. This section of roadbed includes the meeting point of two separate Federal aid, paving projects, each applying a different type of surfacing. From the east, the 1928 project used a pure Portland Concrete, Bates Type surface, while the western part--paved in 1929--utilized a Modified Bates Type design, consisting of a two-inch asphalt surface over a five-inch concrete base with nine-inch concrete edgings. The more complex Modified Bates Type surfacing required an on-site chemist. Although the simpler Portland Concrete was cheaper, easier, and effective, the modified version shows the ongoing willingness to experiment as the steadily increasing volume and weight of traffic required better road surfaces. At the point where the two projects met (about midway in the road segment) stands the original three-foot high Federal Aid Project marker with its inlaid brass shields describing both projects. This section served as part of Route 66 until the construction of a multi-lane alignment to the north in 1952. This 18-mile segment is largely a straight road of Portland Concrete that linked the western Oklahoma towns of El Reno and Hydro. Topographically, the road courses through a distinctive area where the open country of the West begins to emerge. A highlight of this segment is the famous El Reno cut off, a straightening, shortening and paving project begun by the State with Federal aid in 1930. When completed in 1934, this project created a more direct alignment of Route 66 between El Reno and Hydro, eliminating an original dirt route that jogged north through the towns of Calumet, Geary, and Bridgeport. The new alignment in response to the ever-growing traffic along Route 66 hurt these bypassed towns. Bridgeport became a ghost town. The new alignment’s construction standards demonstrate the progressive adjustment of road design to increased traffic volume: the roadbed’s width adhered to the 1930s standard of 20 feet over the previous decade’s 18-foot allowance. The new roadbed also boasted a system to facilitate drainage in rainy weather, which included a parabolic crown, lip curbs, and gutters. This same project also replaced a private toll bridge, the Key Bridge in Bridgeport, with the public William H. Murray Bridge, which spanned the south Canadian River along the new alignment. This nearly 4,000 feet long, 38 span bridge was a 1930s engineering marvel. As was often the result with such modernizing projects, the new road soon was lined with commercial start-ups ranging from service stations and cafés to motor courts. This segment of Route 66 flourished until the construction of a new alignment further north in 1962. Miami Nine-Foot Section: This three-mile long segment begins at the junction of E. 130th St. and South 550 south of the city of Miami, OK. From this point, it proceeds west for one mile, then curves to the south for one mile, before turning west for another mile. It terminates 50 feet from the present Route 66 Highway. West Sapulpa: This segment is currently designated Ozark Trail and is located approximately one mile west of Sapulpa, OK beginning at the junction of Ozark Trail and SR 66, one-quarter mile west of Sahoma Lake Rd. Traveling west, Bridge No. 18 at Rock Creek is located about one tenth of a mile from this point. The Biven Creek Box Drain, which appears to be a conventional bridge, is located along the roadside two miles west of the starting point. The guardrail, which is actually the visible portion of a concrete retaining wall, is located slightly over two miles from the segment’s starting point. The railroad trestle is located about one half mile to the west of the guardrail. Ozark Trails Section: This dirt road segment is located west of Stroud, OK. After the junction with State Highway 99, travel one mile and turn left on N3540 Rd. and go almost a mile before turning right at the obelisk and then passing over Dosie Creek with its now replaced bridge. 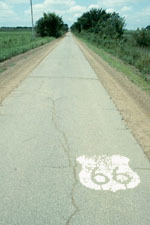 The segment will reconnect with the 1930 alignment of Route 66. Arcadia: This segment is located one mile east of Arcadia, OK at the intersection of Oklahoma State Highway 66 and Hiwassee Rd. From there it travels in a southeasterly direction for approximately one half mile before entering a banking, uphill left hand curve of about one tenth mile in length. It then turns east for about three tenths of a mile, where it reconnects with Oklahoma State Highway 66. Bridgeport Hill to Hydro: This segment begins just east of Bridgeport Hill, OK as it intersects Spur Route 281 and ends at the turn north to Hydro on State Highway 58. The William H. Murray Bridge is located east of Bridgeport Hill. For additional information on driving Route 66 in Oklahoma, visit these websites: Oklahoma Route 66 Association and Oklahoma Route 66 State Scenic Byway.